From M40 J15 follow the signs for Warwick. At the top of Princess Drive turn left onto Emscote Road, continue until you reach the guest house on your right. 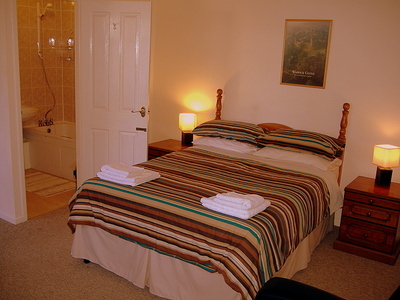 Based in Warwick, Jersey Villa Guest House is in the heart of Warwickshire. The guest house was built in the 18th century and is on the borders of Leamington Spa and Warwick. Close to the M40 and Railway networks which are within within easy access. The guest house offers quality accommodation and bed and breakfast service to all the public world wide. We also have ground level rooms for easy access. Jersey Villa is ideally located most attractions are within a 15-20 mile radius. Warwick Castle - The most visited castle in England throughout the year various events take place. One of which is the Kingmakers (mediaval) Feast, a 5 course feast most Friday and Saturdays throughout the year. Market Hall - Warwickshire Museum - Displays local archaeology, natural hsitory and geology. Track the early hsitory of Warwickshire. Colligate Church of St. Mary - Famous for its Beauchamp Chapel, Norman Crypt, mediaval/tudor tombs and tower. Holy Trinity Church - On the banks of River Avon, is probably England's most visited parish Church. Shakespeare's Grave and the graves of Anne Hathaway, Dr John Hall and his wife Susanna Shakespeare. Stratford Upon Avon - Shakespeare's birthplace. Warwick Race Course - Warwick Race Course is one of the leading flat and steeple chasing courses and has a regular programme of 25 meetings throughout the year. Parks and Gardens - The town of Warwick is graced with a wide variety of attractive parks and gardens.